After the release of WordPress 3.2.1 you can see a new WordPress Dashboard, I know many of us do not like it, neither do I like it, the sidebar is good but the header and etc is not, and also you can see the earlier links of clearing cache and etc will not be visible now, that's the biggest lose for us now we cannot clear cache every now and then or do the work easily. 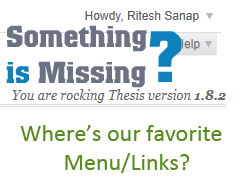 But now we can return our Favorite Menu and enjoy all the older links using just a WordPress Hook to add the extra links we want to the Favorite Menu just this time the location of its will be in the Top Most place were there is written Howdy, your username. 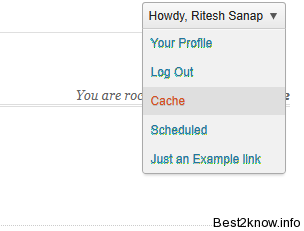 I hope all of you like your new Favorite Menu and it should reduce time taken to do that work like clearing cache. How to Save Online Flash Games and Greetings from the Internet for Offline Play ?